Something thumped in front of me. A bottle of wine. “It’s fine if you drink directly from it,” was all Mor said. This book ensnared me – body and soul – and the last hundred pages? Whew. Talk about stress – like actual heart-pounding stress. For those who don’t know me, I stress-bake. I was 18 cupcakes and double-batch of cookies deep by the time I reached that end. Man-oh-man. My apartment is now a bakery. 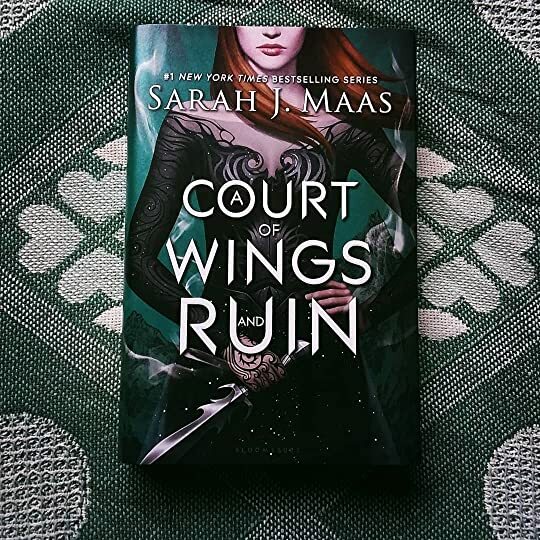 Feyre, now ruling the Night Court with Rhysand, is about to go to war. King Hybern’s army is set to march into the human world – ready to slaughter and enslave. The only chance to save her people is to unite the seven courts and mount a resistance. Only, the odds could not be more against them. Mile after mile. A kingdom of the rotting dead. And still I looked. Every direction they turn, the King is two steps ahead – already butchering and torturing anyone who stands in his way. His army – limitless, his powers – fueled by the very Cauldron itself. The more Feyre and the Night Court resists, the more likely it seems like they’ll lose. Not only the war, but everyone they hold dear. I repeated their names silently, over and over into the darkness. Rhysand. Mor. Cassian. Amren. Azriel. Elain. Nesta. And yet, despite all the pain and the sorrow flowing around them, one thing remains steadfast. One thing remains absolutely certain. I would have waited five hundred more years for you. A thousand years. And if this was all the time we were allowed to have … The wait was worth it. Whew. This book was the most stunning of the series so far. Sarah J. Maas juggles so many unique personalities – from the sweetest human to skin-crawling monsters – without them blending into caricatures (Every time, she astounds me with her creations). Her world has such depth that I’m constantly amazed by the little, reoccurring details (I feel like I could walk the city of Velaris without being lost for a moment). Her characters feel real – their personas, their movement, their banter – I felt like they were right in front of me, rather than words on a page (how is it possible to fall in love with so many characters in one book? ).